The Pierrelatte centre meets all new requirements for core nuclear training as well as those of EDF’s Nuclear Protection Division (DPN): EDF’s MEEI1 programme, simulations in premises identical to those of a nuclear power plant, validation of technical actions, etc. The centre also houses a training worksite for Core Nuclear Knowledge and a radiation protection worksite certified by CEFRI, the French radiation protection certification committee. Overall, the facilities can accommodate 2,000 trainees a year. Training plays a key role in the array of services developed by the SOCOTEC Group for the nuclear industry. 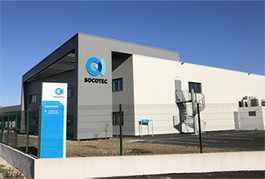 SOCOTEC has 600 employees specialising in nuclear activities and over 40 years’ experience in the sector, where it generates annual revenue of €60 million.